Here is Hope – One Single Purpose…. Daffodils wave their bright bonnets in the cold March wind. Lively, early birds sing to trumpet a season soon to arrive. And we wait on this Good Friday for Promises yet unseen. All of us awash with Hope. The Cross takes our breath away reminding us of not just our failures but our complete and utter inability to be enough. Perfect enough. Right enough. Pure enough. There is no hope for self-sufficiency. No work that leads us towards redemption. We cannot be righteous in our own skin. It’s not possible. That’s why He did it. The Perfect One. The Righteous One. The Holy One. Because He is the only One who could. – His perfection covers our imperfection. – And His sacrifice removes our sins from us. As far as the East is from the West. Here is Hope and Life. We are not the sum of our mistakes. We don’t have to be marked by our past. We have nothing to pay, nothing to earn. We just need to believe – that His sacrifice was enough for anything we have done or will do. And then we live a new Life in that Love, with Hope and glorious Peace. It was darkest hour of man’s creation when He took our place as payment for sins on the cross. But it was the brightest of mornings when the hand of God brought Life out of a tomb. He’s still in the resurrecting business. For the lost soul, the wounded heart, and the broken life. It’s Easter Week. Here is Hope. 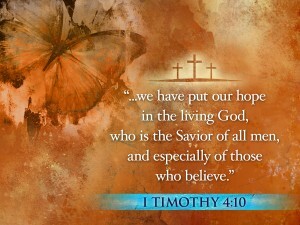 We put our hope in the living God, who is the Savior of everyone, especially of those who believe.